Today's article is from Meghann Hawes, General Manager of Caribbean Trading in Puerto Rico. Puerto Rico is becoming increasingly known as a gastronomic destination. Puerto Rican cuisine incorporates the flavors and ingredients of its Taino Indian ancestors, along with Spanish and colonial influences and American flavors to create a cuisine and flavor profile all its own. From the casual roadside food stand to fine dining restaurants headed by world-renowned chefs, there are limitless possibilities to eat your way through Puerto Rico. The question is, where to begin? Puerto Rico takes breakfast very seriously. Beginning with coffee. Puerto Rico offers up one of only three Super Premium coffees in the world and it is served similar to an espresso. Then move on to some of Puerto Rico’s quintessential pastries: the Mallorca is eggy and sweet, similar to a brioche. It can be eaten alone or as a sinfully good sandwich. The Quesito is a cheese-filled pastry twist that can be found in every bakery. Also try the Brazo Gitano, Puerto Rico’s version of the jelly roll. The city of Mayaguez is known particularly for this sweet treat. Wherever you travel throughout the island, you will encounter the roadside food stand or kiosko. These are the places that serve the typical Fritura – fried snacks – that Puerto Rico is well known for. These fritters are pasties filled with meat, fish or cheese and are either dough-based or plantain or cassava based. Try an Alcapurria for something a little unusual. It is filled with meat or fish and has a cassava/plantain outside. The most famous kioskos can be found in Pinones, Loiza (just east of the airport) or in Luquillo (on the eastern coast). A visit to Guavate in Cayey is also a must to experience the legendary Lechon. Lechon is a full pig roasted on a spit; a time-consuming process that takes most of a day. They can be found on the weekends throughout the island, but in Guavate you are able to experience this specialty any day of the week among the over twenty restaurants that serve it there. 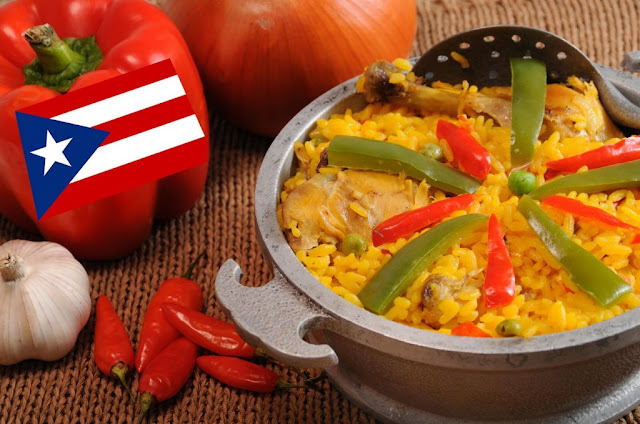 It is paired with other Puerto Rican specialties such as Rice and Beans; Batata (sweet potato); Yucca (cassava); and various Bananas (Tostones, Guineos Escabeche, Amarillos). There are excellent restaurants throughout the island, but to experience cutting edge and visionary gastronomy by renowned chefs, you need look no farther than San Juan. Visit one of Wilo Benet’s restaurants: Pikayo or Varita. He was on season one of Top Chef Masters and he is known for taking authentic Puerto Rican foods and reinventing and twisting them into something familiar yet extremely creative. Visit Roberto Trevino’s Budatai or Mario Pagan’s Laurel, located at the Museum of Art. There is some amazing culinary talent on the island! There are several excellent food festivals throughout the year. The premiere event is Saborea! in April that brings some of the top names from around the world and Puerto Rico together. The SoFo Culinary Fest is named after the area South Fortaleza St in Old San Juan and is a festival where all of the leading restaurants open their doors for tastings. Bi-annual event, dates vary. Many tour operators are now offering culinary tours of Puerto Rico, where one is able to tour local ingredients and flavors. From visiting the local fruit markets to cooking classes or lunch and dinner tours, there are many ways to get close and personal with Puerto Rico’s top culinary talent.